Everyone making holograms uses something a little different for handling film and/or plates when developing. In my case I use forceps that I bought at the local electronics supply shop. To keep them from scratching the film, which they’ll do very well out of the box as the jaws have extremely sharp teeth, I coat the tips with Plasti Dip to give them a somewhat hard coating that grips film and glass equally well. Any of you that are using Kapco or a similar material for laminating film to glass have undoubtedly had a failure and needed to remove the film from the glass. You’ve also probably found that the longer the film is on the glass, the harder it is to remove the film and laminate cleanly without leaving bits of adhesive behind. Paint thinners work but are more difficult to use than you might think. This is an excellent way to tell the administration that domestic wiretapping of the kind the Bush administration has been involved in is not supported. Are we about to get a class of lawyers with a conscience? What do you normally think when you get a sales call and the person on the other end says he is responding to a request you made online? Many people would respond that the person made a mistake, ask to be taken out of their database and forget about it. That’s what I did. What if you got two similar calls in the same hour? What if you received 32 such calls in a single day? What if those calls continued day after day? That happened to me. And that was only the beginning. There’s a group raising money to fund a new season of FireFly. If you haven’t seen the series, go see it. If you haven’t seen Serenity, the movie, go see it. Then pony up a few dollars. Update Jan 18, 2006: Or maybe not. Appears that the people involved were convinced that money from fans would never get Serenity off the ground and donations have been halted for the time being. Keep an eye on the site for future news though. Update Jan 29, 2006: Go to the browncoats site and follow the recommendations for getting another series off the ground and then go to http://www.fireflyseason2.com and fill out the survey to help some more. "E-books have not made much of an impact as the experience of reading on-screen has failed to live up to expectations. As a result although sales of e-books are growing they still account for only a tiny fraction of the overall book market. 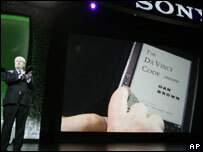 The electronics giant aims to address this with the electronic paper used for the display in the Sony Reader. It says the six-inch black and white screen will be as easy to read as the printed page. The technology used means the screen is not backlit, avoiding screen flicker, which can put a strain on the eyes. The device’s display uses technology developed byUS-based firm E-Ink which works by electronically arranging thousands of tiny black and white capsules to form characters." I’ve been working on a penguin layout for several weeks now and finally got a good scene combined with the right lighting. March of the Penguins was the obvious inspiration. Author Michael HarrisonPosted on January 8, 2006 Categories Holograms, Lab NotesTags EDTA, Holograms, interesting, Lab Notes, snow, TEA1 Comment on Fly little penguin, fly!